Many homeowners these days seem to be looking at steam cleaners, which have become a hit due to their effective and eco-friendly operation. The thing that really drew us in is the natural ability of steam to clean without irritating detergents. These machines will readily handle the usual messes that arise in baths, kitchens, and other hard-surfaced areas, without much brushing and chemicals. We look at the Bissell PowerFresh Deluxe Steam Mop, a free-standing steamer that can be carried and used anywhere in the household. Unlike the lower model, it has a secondary scrubbing nozzle for dislodging stuck-on messes. Steam flow can also be tweaked to better handle the dirt and grime that builds up in even the tidiest homes. This lightweight steamer is particularly good at clearing hard floors and offers a lot of well-designed features to ease the chore. Discolorations that can be challenging to remove with a brush and soapy water are readily tackled by jets of hot vapors. Really filthy floors may need extra brushing, but an hour or so of steam cleaning is easier by far than clearing an entire floor by hand. The technique is also effective for cleaning laminate floors, using lower settings designed for the purpose. Wooden laminates can tolerate infrequent spills, but any leftover dampness that slips past into their cores can result in long-term damage. Carpet extractor cleaners are not recommended for treating laminate floorboards as their pressurized streams can get through the edges and cause much harm. Gentle mopping with a light flow of steam that alternates with dry microfiber mopping is safest in these cases. Contact at temperatures beyond 212°F is lethal to microbes and small crawlers and will quickly eliminate bed bugs and dust mites even as it sanitizes the affected spots. These natural cleansing properties let parents clean stuff in a way that’s healthier for kids at home. This canister-type steam mop weighs about 6 pounds and is designed to stay upright by itself. Assembly is easy enough, you will only have to snap the main parts together and affix a few screws before you can begin. There is no power switch so once you plug in, the boiler will start heating up and generating hot vapors within 30 seconds. There is a protrusion on the handle around which you can wind the cord when it is not being used. Output can be quickly adjusted to low flow or high using easy-touch controls, which allows for longer sessions when heavy steaming is not needed. The hot jets flowing down the nozzle work to liquefy stains and greasy spots, even the stubborn films that tend to persist on old tiles. Microfibers in the attached mop pad pick up the loosened residue while absorbing any excess moisture that might condense on the ground. You will still be brushing off the toughest encrusted messes by hand, though. Like the standard PowerFresh, this model features a low-profile but broad mop head. When removed, it exposes scrubbing bristles on the nozzle end that are used for tackling stickier messes. The triangular head is attached via a flexible joint, so you can lower the shaft in order to reach under the lower edges of furniture and fixtures. The reservoir’s lid can be opened at any time, which means it can be repeatedly refilled. This capability can be very convenient for extended jobs, with a supplied measuring cup to makes things even easier. The pads can be put in the washer and recycled over a few more uses. A set of two plus a glider is included, along with scent discs that exude a refreshing Spring fragrance. Most buyers order extra pads, knowing that bigger jobs will need more a few on hand. Water capacity is normal for this canister type and size of the canister. Almost 15 minutes’ worth of steaming is possible from a full load, which should be enough for all but the biggest and dirtiest jobs. A generous two-year warranty from the manufacturer provides peace of mind. Once the reservoir is filled with water and the unit is plugged in, steam will be produced and start flowing in around 30 seconds. It’s nice that the body can stand up on its own, so you don’t have to hunt for furniture or a wall to lean it against. The operation is quiet and it is simple to adjust the flow. It’s usually best to start with the lowest setting before raising the flow as required. You will normally treat solid or engineered wooden boards using the lowest setting. Steam is always being produced with the boiler powered up, which is easier to manage as you will not have to constantly finger some trigger. However, there will always be those times when you must pause by unplugging the unit, which is inconvenient when it happens. Fine jets of vapors are normally produced in use, but some users noted that tiny puddles of water do occasionally appear. Although you can run the head on carpets and rugs, it cannot deep-clean like the specialized carpet cleaners with their soaking and extraction functions. If you put too much time steaming a small area, small amounts of water can pool on the floor and leave streaks, especially where there’s a lot of dirt around. The mop head maneuvers easily enough around furniture, but its tall profile can be fiddly to slide under low edges. Its joint does not allow a full sideways turn when sliding about obstructions, either. The wide edge of the mop’s head also tends to restrict its reach in and around tight spaces. On the other hand, the broad steam path will allow you to cover a larger area in a single pass, which will speed up most sessions. More water capacity would have enabled lengthier cleaning between refills, but the output can be made to last a bit longer with the low flow setting enabled. Thankfully, you won’t need to wait for the housing to cool down much before refilling the reservoir. But as always, if you allow it to get empty then you will have to pause as more steam is produced. Like other designs in this price range, there is no dedicated water-level indicator. Users like that this premium model is lightweight and can perform most steam cleaning chores well. “Absolutely LOVE this product” is frequently heard from users. Many were happy that they could always top up with water as they mopped since the reservoir can refill without having to unplug the unit. A buyer posted that “I have to give two thumbs up to this beautiful appliance”. 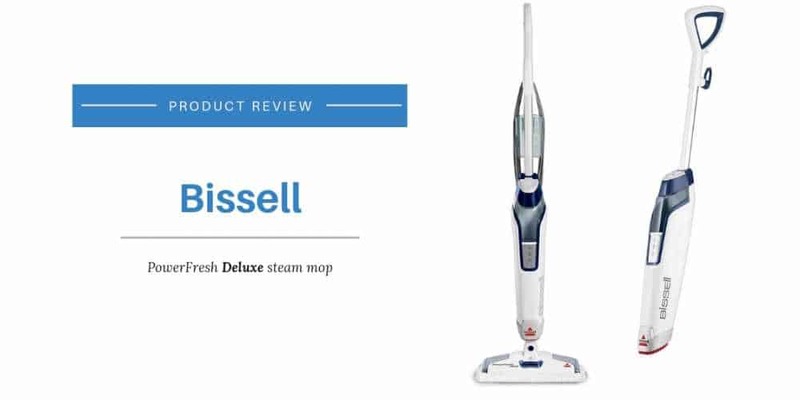 With experiences like these, it’s no wonder that the Bissell PowerFresh Deluxe Steam Mop draws a large number of positive reviews at Amazon. Many say it is nicer to operate than similar steam mops, which explains its decent 4-star score (out of 5). We were concerned with a few reports about inconsistencies in output flow. Nevertheless, this low-profile design offers one of the widest steam paths around, covering larger areas at a time than rival designs. 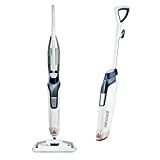 The Bissell PowerFresh Deluxe Steam Mop is lightweight, easy to operate, and works well at cleaning hard floors. It’s not much pricier than similar designs and comes with a two-year warranty, which represents excellent value. The well-thought-out design has the water reservoir mounted near the top, so there is no need to sideline the whole unit when doing refills. You just have to top it up constantly with water to keep things hot and flowing when working larger areas. As an eco-friendly alternative to regular wet mopping, this steam mop excels at refreshing tile, slate, and other hard-surfaced floors. You can’t do much better if you‘re looking to refresh a lot of hard-floored spaces on a regular basis.